Raptor Watch is organised by Malaysian Nature Society, is a festival to celebrate the return of the migratory birds of prey or better known as raptors on their journey back to their breeding grounds in the northern hemisphere. 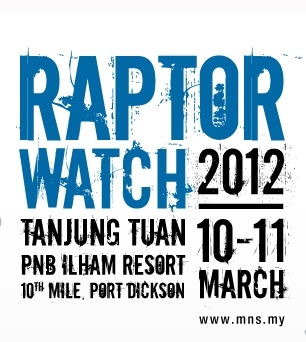 Raptor Watch is a public event meant to raise awareness on the conservation of raptors and their habitats. RAPTOR HUNT (treasure hunt) and GREENaid , a concert by musicians passionate about our natural heritage and our conservation efforts. Nature guided walks and talks are planned out for both days, The Great Green Clean Up, an initiative by Green Living asking you to help clean up designated locations and exciting games for both adults and children including repelling. RW is held annually on the first weekend of March. For the year 2011 the event is held on March 12 & 13 (Saturday & Sunday). Best time to watch the raptors will be between 11 a.m. and 3 p.m. In the past there have been records of birds flying as late as 6 p.m. The reason why raptors choose to fly during the hottest period of the day is because they need thermals. The event is organised by Malaysian Nature Society in partnership with the Malacca State Government.